Artist's concept of a dust storm on Titan. The Saturn moon is the third world, after Earth and Mars, known to have dust storms. Images from the 1930s captured the immensity of the American Dust Bowl, and modern snapshots reveal massive "haboob" dust storms intensely rolling over the Sahara Desert. Now, astronomers have taken pictures of something stunningly similar on an altogether alien location: They observed dust storms on Saturn's moon Titan. 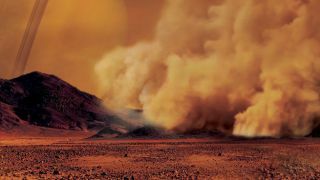 The discovery of dust storms blowing across Titan's equatorial region makes the moon the third body in the solar system, after Earth and Mars, known to have the tempests. Bright spots appear in this animation, based on images the Cassini probe captured with its Visual and Infrared Mapping Spectrometer (VIMS) during several Titan flybys in 2009 and 2010. A research team has interpreted these features as evidence of dust storms. "Titan is a very active moon," said Sebastien Rodriguez in a statement from NASA and ESA. Rodriguez is an astronomer at the University Paris Diderot in France and the lead author of the paper, published Monday (Sept. 24), detailing the team's findings. "We already know... about its geology and exotic hydrocarbon cycle," he said. "Now, we can add another analogy with Earth and Mars: the active dust cycle." Just like the Atlantic Ocean produces the wet hurricane season now occurring on Earth, the methane and ethane on Titan form powerful storms near its equator as the sun causes those hydrocarbon molecules to evaporate. This unique methane cycle was first detected by Rodriguez's team, when they spotted three odd, equatorial brightenings in some of Cassini's infrared images. A compilation of images from nine Cassini flybys of Titan in 2009 and 2010. In three instances, clear bright spots suddenly appeared in images taken by the spacecraft's Visual and Infrared Mapping Spectrometer. Initially, the team thought the bright spots in Cassini's 2009 and 2010 images of Titan's northern equinox were just these methane clouds. According to the space agency's statement, the researchers ran models that indicated that these features were related to Titan's atmosphere but located close to the surface. The team ruled out terrain as a cause, because land formations would have had a different chemical signature and would obviously remain visible for much longer than spots did. The bright spots "were only visible for 11 hours to five weeks," ESA officials said. Because the features were close to the surface and located over the dune fields around Titan's equator, the team deduced that the bright spots were clouds of dust moving across the distant deserts. The study detailing the findings was published on Monday (Sept. 24) in the journal Nature Geoscience.